Kaye Barley: I'm one of those people who can track her life by music. It's been important to me for as long as I can remember. I remember when I was a little girl sitting in our big old kitchen watching my parents dance. My dad would step into the kitchen and turn on the old radio that had a permanent spot just inside the door. He would listen for a sec, turn the radio up, grab my mom's hand and the two of them would jitterbug all over that kitchen! We ate more than one burned dinner - and it just didn't matter 'cause the music was still swirling in our minds along with the laughter. As I got a little older, I remember trips the three of us would take to Atlantic City to the Steel Pier, planned around who would be appearing on stage that my parents wanted to see. We saw Bobby Darin, Paul Anka, Fabian, Conway Twitty and a Lawrence Welk Show (my dad had a big crush on the Champagne Lady). We saw Brenda Lee and Teresa Brewer and Louie Armstrong. My mom and dad had a favorite club they would go to on Saturday nights - and usually when they came home the band, The Hurricanes, came with them, along with their wives or girlfriends. I remember many a night of musicians jamming in our living room until the sun came up. Good times and good memories. All around music. Live music is the best. It just works its way into your soul and into your heart - right down to the soles of your feet. I'm addicted to concerts. One of the first concerts I remember buying a ticket for as a grown-up person, now attending these types of events on my own with my mom and dad, was for a show at the University of Delaware. The Temptations and The Four Tops. Together. Wow. And I will neve forget it. That was the beginning of my love for MoTown and that love hasn't diminished one bit. That is "my" music. I saw Otis Redding on stage in Baltimore shortly before he died, and I've seen most of the greats from back then except The Supremes. I'm sad not to have ever seen The Supremes. I sang into a hair brush a lot of times pretending to be Diana Ross, but never have seen her. Rock and Roll - oh yeah - love it! I've seen almost everyone I've ever wanted to see in concert except I didn't get to see The Beatles. I've seen Paul McCartney and the energy was amazing. I can't even begin to imagine what it would have been like to have seen him with George, Ringo and John. Country. Oh my oh my - I have always been a fan of country music. I know there are a lot of people who miss old traditional country, and I do too. I could listen to Ferlin Huskey sing "On the Wings of a Snow White Dove" 47 times a day and not get tired of it. But I'm a fan of a lot of the newer country also. Not all of it, but a lot. But you know, I'm not fond of all rock music, or all classical music. I'm not going to categorically dismiss a whole genre of music just 'cause there's some I don't like. Well - not true. I'm dismissing Rap. totally. Sorry - but do not try to tell me about it's redeeming qualities, I don't care. I'm an old fart. What this is all leading up to is that I am flying high today. Donald and Harley and I have just returned from Nashville. My friend Maryglenn invited us to attend the Country Music Awards with her and it was like a dream come true. I had never been to Nashville before, but oh Boy Howdy, do I plan to go back. I loved it! We had the most fun walking down Broadway. I love the mix of the old and the new, side by side, and how Nashville embraces its history. And the CMA Award Show was awesome! Beyond awesome. When Blake Shelton and his wife Miranda Lambert walked up on that stage to accept the award for the winning Song of the Year "Over You," I was just a complete and total puddle. To get to watch him come back to accept Male Vocalist was too fun! And then, Entertainer of the Year - wowie! He's one of my faves, as is Brad Paisley who is, I think, a major talent but also funny as all get out - he kills me! 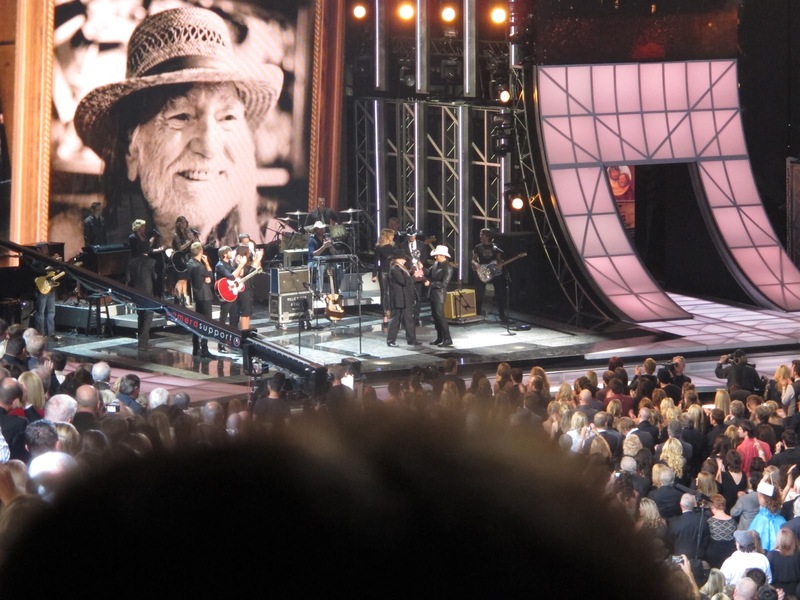 To be able to witness the tribute to Willie Nelson - my all time country music hero - was the perfect topper to a perfect few days in Nashville. Y'all - life is good. Music just makes it a little bit better. How 'bout you, Reds - do you love or hate country music? Do you have a favorite performer in any music category? A favorite live performance story? Let's hear all about those music experiences, please! Kaye... you saw Louis Armstrong? Wow, I have his version of "it's a wonderful world" on my ipod and listen to it all the time. Brings me to tears. He's awesome. I saw Willie Nelson and he was great. What a fun article to read... thanks! Wow! Can't believe you were there..so cool! Why is my first thought...what did you wear? And are those all YOUR hats? Kaye, you have me floating in memories. Your music is my music. That clip of the Temps and the Tops made me want to grab Carol and jitterbug. Sorry you didn't get to see Diana and the Supremes on the Steel Pier. I did. And Boy Howdy, I wish I'd been in Nashville with you and Don. Thanks a Texas Ton for this piece. Muchluv, Darlin'. Cathy, Hey!! Isn't Willie just the best?! I've seen him lots - if he knew how many times he would probably accuse me of stalking him. I can't help it. Ro - I've added a picture at the bottom of the blog so you can see what I (And Donald!) wore. I love Dwight Yoakum and Lyle Lovett too. Earl - I can just picture you and Carol jitterbugging away. That you saw The Supremes and I didn't just kills me! 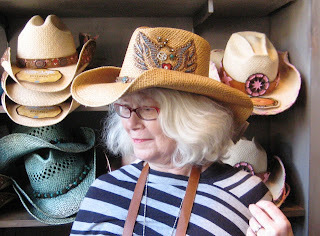 and there are more CMA and Nashville pics in a piece I did yesterday at Meanderings and Muses. Me too Kaye, love all the music you mentioned. I lived in Tennessee for four years so I got to love country. One of my favorites--STAND BY YOUR MAN by Tammy Winette.(sp?) And absolutely anything by Patsy Cline. I can't believe I haven't been to the grand old opry--got to put that on my life list! What a wonderful experience, Kaye! And you've got me reviewing all the musical influences in my life. I like my music a little complicated, and I love the clever lyrics of country music in the same way I love Cole Porter, Paul McCartney and Donizetti. How dull life would be without music! What fun, Kaye! I remember seeing some of the same people through the years that you did (though never The Temptations and the Four Tops together!). My favorite live musical memory, though, was seeing Janis Joplin live at the Fillmore in SF--when she was just the singer for Big Brother and the Holding Company! That was when she was at her best. My last live concert was when Holly Near came to KC, and I took my youngest son when he was 7 or 8. I had earlier seen her in concert at a professional conference for university women's center directors and bought her tape and brought it home. Joseph loved it to death and played it over and over, got her autobiography when it came out, and this was his chance to see her in person and get his book autographed. Because of sound system difficulties, the concert started over an hour late, but it was grand. Afterward, it was way past his bedtime, but the sleepy little guy insisted on waiting in the loooong line to get her autograph. The women in the line saw this eye-rubbing little boy and one-by-one pushed us up to the front of the line, so he could talk to his idol and get her autograph. She was a doll, and he went home with stars in his eyes and read that trade paperback until it fell apart and we had to buy another, in which he tucked that precious autographed page. Dr. Joseph still loves music as much as his mom does--and he's still a fan of Holly Near. What a great tribute to music, and it is amazing how our tastes match. I love country (especially older country but some of the newer too), rock 'n roll (50's and 60's are my favorites), and Motown. I envy you all the concerts you've seen. Out here in the middle of nowhere we don't get a lot of concerts, or didn't when I was younger. Saw a few in my 20's and 30's like Garry Morris and Kenny Rogers. My favorites are still the Statler Brothers, I love their lyrics and the stories they tell. So glad you had a great time in Nashville. So cool, that you guys were there. Picture me as green as grass with envy, Kaye. I was able to see Willie Nelson in concert with John Fogarty a couple years ago. Wow. Did you know that Willie's sister has been playing piano for him for something like 50 years? I love that. Lucy - I loved Tammy Wynette. What a sad sad life she had. One of my all-time favorite albums (I cannot bring myself to say all-time favorite CDs, but I'm working on it) is Honky Tonk Angels with Tammy, Dolly and Loretta. Blows me away! and Patsy Cline? wow. Just wow. Sandy, Hey! I knew you were a huge fan of opera - of which, sadly, I know nothing - but did not know your music tastes were so varied. I love that! Oh, Linda - this story about your Joseph touched my heart. How special that memory is to both of you. Oh, Patty - Nashville spoke to both Donald and I. We both have a little honky-tonk in our souls. And we're both fascinated with history and architectural integrity - Nashville does it right. Walking into Ernest Tubbs old record store was awesome like I never expected. Karen - I did know this about Bobbi Nelson! (besides loving his music, I've read every word written about him and more recently, by him). His harmonica player, Mickey Raphael, has been with him almost as long, as some of the other band member, I "think." That pretty amazing, isn't it? I love that too. Love those red boots, yeah! At one time we lived at the top of Kern Canyon above Bakersfield. Hag's place was at the other end. You know the song. I still cry when I hear it. When we moved down the canyon into Bakersfield, so I could do more graduate work, his song followed me. When I was ready to go home to Boston and Harvard I was scared, because I was used to living out in the wilderness and on a ranch. I packed my little Mac computer and got on the Southwest Chief headed back home for the first time in over 20 years. I had my old-fashioned pocket radio and headset, and I prayed there would be music I could listen to back in Boston. I wasn't the same girl who'd run away all those years before. I cried the first six weeks I was back. When I got up the courage to go out to The Square, I put my headset on, then the knit cap my neighbor back home had made me. I walked out through The Yard toward Au Bon Pain and had my first-ever square croissant. That was scary. I headed back toward Divinity Hall where I lived and turned on the radio for the first time since being back in New England. I know it doesn't sound right that I would've been scared, but I was. It was different to me now. All I wanted to do was go back to Bakersfield. Kaye, I'm a rock and roll girl, I'm afraid. The first album I ever bought was Meet The Beatles. And I did see the Beatles. Wish I could say it was a great experience, but it was just girls screaming hysterically. Couldn't hear and couldn't see. I saw Paul McCartney on his last tour and he played for THREE hours!!! How he does it, I don't know, but he was fantastic. I've seen Sting three times, and the Police reunion tour. Sigh. I've never been a big country fan, but love Willie (how can anyone NOT love Willie?) but because I watch The Voice, I've come to adore Blake Shelton. Not only so cute, but such a nice and funny man, and so talented! I know I said it on Facebook, but you and Donald looked fabulous! So glad you had a good time! Reine, hi! I am a believer in things with no explanation other than "it's meant to be." and as I've grown older I've learned not to question it. And I believe that the music we need finds us when we need it most - as do the books we need. LOVE Merle Haggard, Buck Owens and Dwight Yoakum. All kinds of music turns me on, so I am very lucky. what's strange to me is that I'm beginning to love country music more and more as I get older. Maybe it's the humanity, and simplicity that touch me. Anyway, love your pictures, and that you took Harley with you. Debs, hey you! and thank you. Willie makes his own kind of "Willie Music," doesn't he?! He's impossible to put a label on. When a man "walks what he talks" like Willie Nelson does I'm willing to follow him almost anywhere (long as he makes me laugh along the way). And oh my yes - I agree with your feelings about Blake Shelton. and oh my - he's so tall . . . sigh. Hi, Lil - the "humanity." Yes!!! I love that. I think we're all drawn, at some level, to the simple things in life - or what we perceive as the simple things. Often our dreams are not our reality - but that's okay. It's why we're drawn to music and to stories, and it's how they came to exist originally. And Harley loved Nashville too. He's become a fairly well-travelled dog now that so many hotels have come around to the "pet friendly" side of life. If we go, Harley goes. Now if he'd only take his turn driving . . . .
Kaye, yep. You are right. A few years later I'd started the second year of my doctoral program. Miserable. I headed back to The Square toward Au Bon Pain. That time my cell phone was playing music. Didn't seem quite right– searching for music song-by-song on a phone... with a video yet. Think time. I needed think time. On my cell, across the face of Willie, was a notice: Incoming Call White Earth. "Hey. Come back to the rez. Hag's going to sing at the casino." So we packed it up, Scout's hair flying all the way, and drove back to White Earth. Hag looked out and sang, "All my friends are gonna be strangers." Y'know? Kaye, It appears you have been living my musical life. I thank you for sharing your memories. They were wonderful. And if you ever want to get some big hair and a red sequined dress, you and I could do "Stop in the Name of Love" together. Reine - amazing! but there you go! Annette - Let's do it!!! I would never ever pass up an opportunity to wear a red sequined dress! Kaye, Country is in my soul. I saw Tammy Wynette do "Stand By Your Man". I saw the Oak Ridge Boys, Ernest Tubb, Dolly Parton, Alabama (twice), Tim McGraw & Faith Hill, K.T. Oslin. Saw Mel Tillis & had a hug from him (another tall one). Of course you know how much I love Don Williams. But, my greatest country love was always for Johnny Cash. I was lucky enough to see him in concert three times. I loved to see him and June Carter. With the Johnny Cash show, I saw the Statler Brothers and Carl Perkins. I always loved the Statler Brothers, as someone else said. But, it was always Johnny Cash for me. Since I can't go see Johnny Cash anymore, I fell in love with Celtic Thunder. I saw their show three times last year, and I have tickets to see them twice at the end of this year. You're right. Life is better with music in it. Lesa, sounds like we've seen a lot of the same shows! (I cried all the way through Don Williams' show - he touched every emotion possible). I have not seen Celtic Thunder but I have listened to their music thanks to you, and I understand your deep love for them. They are very special!! Have to agree with you, Kaye, about rap [and hip-hop] . . . for me, country music is defined "Johnny Cash" [but there are several other country artists I enjoy listening to] . . . my personal music of choice is any album recorded by Julie London. I'm a big country music fan, too. And even watched the CMA awards this year. But I also like a little bit of all music and definitely not all of every category. I am not crazy of really hard metal rock and the older I get the more I like acoustical music. I like to actually HEAR the instruments instead of the reverb. Have you been watching the new show Nashville? I am totally hooked. Jan, Hi - I'm with you about enjoying acoustical music - I've grown to love some of the "quieter" versions of several of my old favorites. We attended an Allman Bros. concert several years ago and they did a gorgeous set of several of their old songs a cappella - and that just blew me away. I have not watched Nashville and the only reason I haven't is because I forget! But I'm going to tune in. I just learned that Brad Paisley's wife is in it and I think she's darling. As you know, Kaye, I'm a lot country. It's a tossup between Willie and Waylon. oh, I just loved Waylon. Hey, Miss Margaret! Hugs!!!!! Oh, oh, oh, I am absolutely GREEN and getting ready to read this whole thing again and watch everything again..and soon after, I am going to move to YOUR house, since you clearly have all the fun. And all the hats. 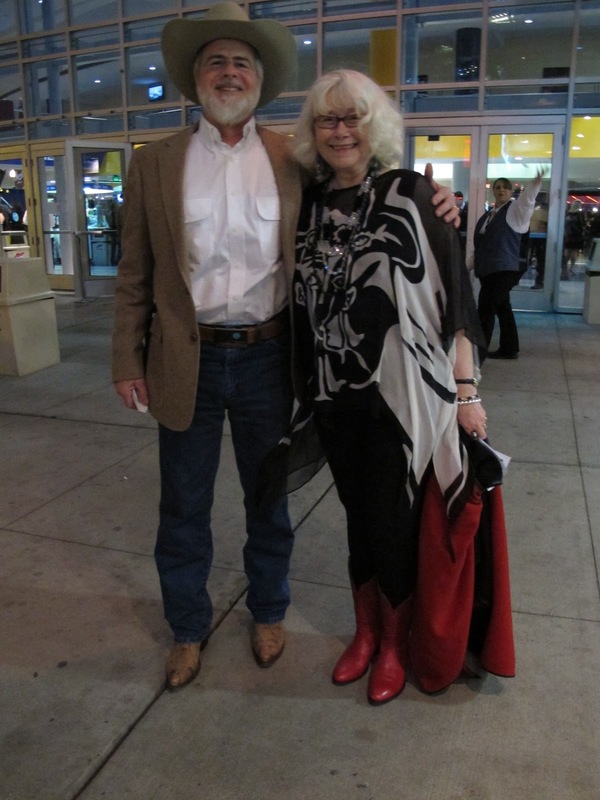 I just saw Judy COllins in concert about a month ago--she was phenomenal. About 250 people in the room, that's all. I love reading all these concert experiences! And I do love country music. I grew up in INdiana, and back then, disdained it. But when I got older, I got it. One the Wings of A Dove is one of my faves, too. And I Remember You. ANd I love Patsy CLine and Dolly Parton--the album with Jolene. And anyone remember Dusty Springfield's Memphis album? Hank! Hey! Oooooh - you would have died over MG's boots this trip. I threatened to knock her over the head for them. But of course, I wouldn't do that - who would do that?! I mean, over BOOTS?! But. They were tall black Louboutins so every time she walked ahead of me I had to look at those red soles. So yeah, I "almost" did knock her over the head to steal her boots. I am a very bad person. sigh. Judy Collins!!! I adore her! and I adore you too.